Water is considered 'hard' when it has excessive levels of calcium and magnesium dissolved in it. Scale build-up in pipes, resulting in decreased flow rates. White film on glasssurfaces and staining on water taps. 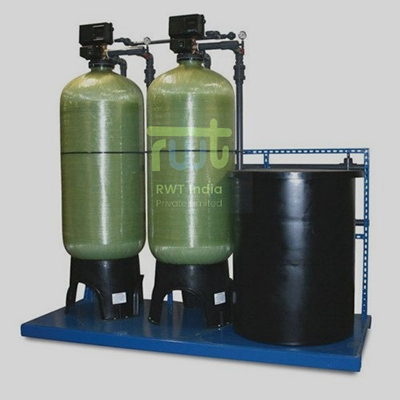 The RWT Series Water Softening Plants are designed to produce treated water to suit for various applications. Treated water is of consistency quality with low residual hardness throughout the service cycle. The high synthetic resin is used to exchange Sodium ion with hardness forming Calcium and Magnesium ions. After producing desired output, the resin is regenerated with iNaCII Sodium Chloride solution after which unit is again ready to deliver next batch. RWT Series units are avarlable with different models. The difference between these models is in the capacity of the resin used for each model. These units are easy to operate and maintenance free. These models are available to produce various capacities up to 200 Cu. Meters per hour maximum.